Everything Beauty and Beyond! 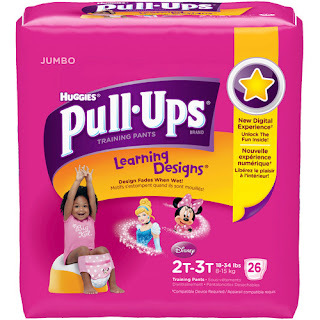 : Huggies Bye Bye Diapers Pull Ups! Huggies Bye Bye Diapers Pull Ups! I recently received from Huggies a free complimentary box of their Huggies Pull-ups for my three year old daughter. You see, in my household potty training has always been a challenge. I have four children and my first child didn't become potty trained till three days before school started. He refused to use the toilet at all cost. After three shut in days that my husband and I spent in with him all (long) weekend long, he finally got it. A day before school started, he started wearing underwear. Needless to say he had a few accidents during school that year, but after a hand full of times, that was over with. My second child is now turning four, and while she loves to sit on the potty, she refuses to actually use it. So she will take her diaper off (after going in it) sit on the toilet and let me know that "she's done!" I have been looking into pull ups, but wasn't sure how she would handle it as she hates (and I mean hates) change! But surprising, she loves these pulls up. A large part is because of the Minnie and Disney princesses that are printed on them. She is learning on how to pull them on and off and also realizing that if she decides to go in her pull ups; well they don't feel awesome. So she is slowly going towards the toilet versus using her pull ups as a diaper. One of the things that also attracts me to this campaign, is the multicultural view of this brand. Normally on just about any commercial, print and so on you mostly fine a white skin tone, blue eye, blonde hair child. While my children are completely white skin toned liked myself, and have black hair, you can tell they not completely "white". So being able to see children of different races on their packaging is awesome! It appeals shows me that Huggies is realizing that everyone, regardless of race needs diapers and pull ups for their growing children. So why not incorporate all these beautiful looking children! I really like these pull ups and well keep using them for my next two kids who are in the next few months will to transition from diapers to pull ups!